In order to rise from the ashes, the phoenix must first burn. I feel as though I am being reborn. I walk outside (away from the concrete) and every smell and sight grounds me more and more within my life. The earth, with the people around me, the sun, the grass, my children, my husband… all part of a circle- a small circle where what you give is what you get when the circle spins again. If we all just give love and kindness, we will share joy. I can smell the grass. I can smell flowers and tree and air. I can feel the pleasure. My therapist said that she’s noticed a certain calmness in me lately. I can feel it. I feel like I have a wonderful mellow high. I hope that doesn’t mean that my pills are doping me up. Maybe this is just how lovely life can be when you are open to seeing how lovely it can be. I know that it has been a long and cold winter but I feel as though I haven’t smelled the grass or breathed fresh air in five years. Like I’m coming out of a long hibernation- escaping the shackles of constant anxiety and fear. I am learning so much about people, about community, about normalcy, about living lightly. I am learning to be patient and forgiving with myself… and with others. I have listened to the depths of darkness within my soul and my mind- I feel ready to see how much love and pleasure my heart can hold. Hi sweetheart. I know that we haven’t met or haven’t spoken much but I love you. Your struggle, whatever shape that takes, is valid and all too real. Becoming a mother doesn’t come easily to anyone (no matter what they say). The mask that we often wear when we talk to other mothers is a huge barrier to getting support. If we had met in the park, we never would have known how much we really had in common, and how much we could help one another. So on this mother’s day, my advice to you is this: be open. Be open with other moms that you meet about how hard it is to become a mom. They will empathize. Be open with your loved ones. They will help you. Be open with your bathroom door (not like you’ll have a choice). And most importantly, be open with yourself. 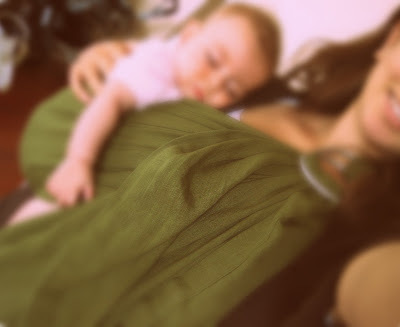 Becoming a mother was the most transformative experience I have ever had. I will carry the scars forever (both physical scars and my new diagnosis of bipolar II). But I will also carry the pride that I faced the biggest challenges that my life could throw at me and am coming out the other side. And every time that I dance with my beautiful 4 year old and 2.5 year old, I feel thankful that I took every resource that I could find (including postpartumprogress.org and ppdtojoy.com) and fought against the demons. Just like the pain of weight lifting (kegels) gives you the reward of stronger (bladder control) muscles, the pain of my postpartum and antenatal depression and anxiety is making me a stronger person and a much better mother than I ever would have been. It took me over a year to realize that there was anything wrong with how anxious I was feeling after my oldest daughter was born. I was not listening to myself. I was not open with myself. And I was not open to others telling me that something seemed off… until I had no choice but to face it. When you become a mother, some people will say that your heart opens up and flows out of your pores. I think that for me, it felt more like my heart opened up and exploded all over my face. Please try to be kind to yourself. I know that it seems impossible. Just try to try. In my recent obsessive googling session on bipolar, I came across this really powerful clip of a woman named Sascha describing what it feels like to have bipolar. I think bipolar is like being in a boat. On an ocean. By yourself. There’s other people but they’re all on their own boats doing their own things. And in the other hand, you hold the strings to a kite. And the anchor is the depression. Keep the anchor from bringing you all the way down to the bottom of the ocean. So, being bipolar is this fine balancing act of keeping yourself afloat in a boat. And you’ve got to hold them really strong and really tight. This clip is from a documentary called up/down. I watched the full documentary for free here. It’s a bit slow but I think it is worth watching the whole way through. I found this because I was looking for a way to help my family (and me) understand what this diagnosis means. If you have any more helpful videos or articles, please let me know.